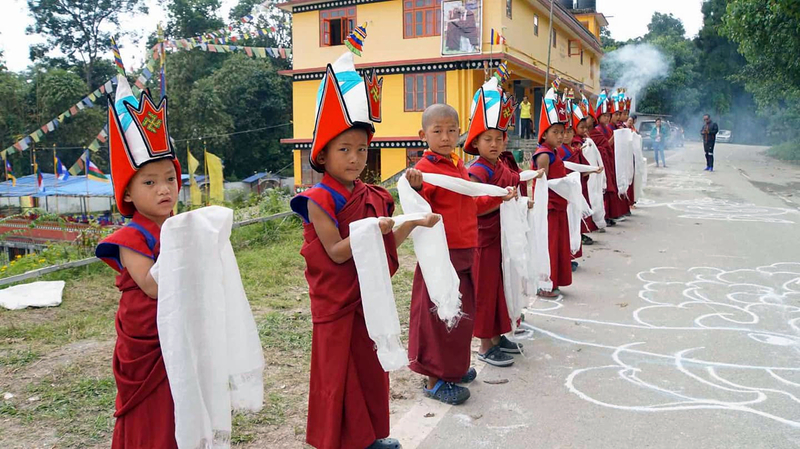 Young Yungdrung Bon monks in Sikkim preparing to receive HH 34th Menri Trizin Rinpoche. Photo credit: Unknown. 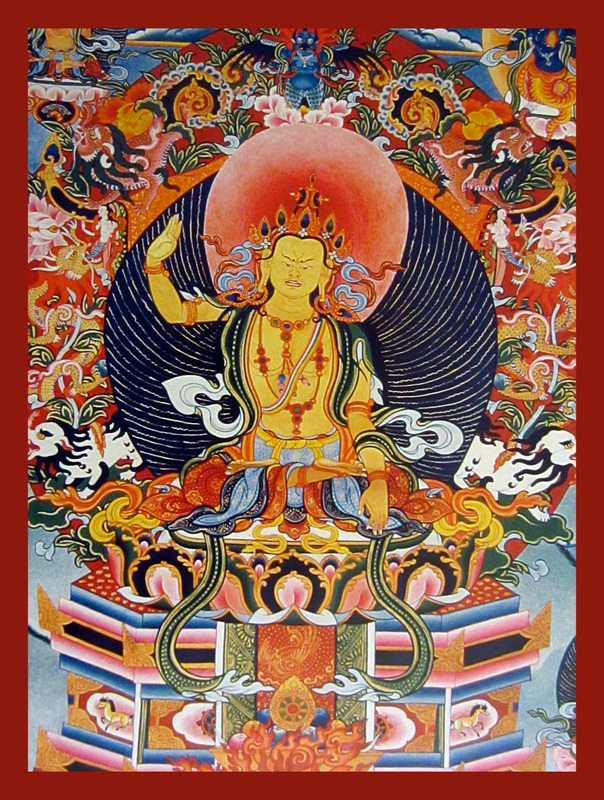 Within the Yungdrung Bön religious tradition, one of the primary guardians who removes external, internal, and secret obstacles for both practitioners and the religious tradition is the Queen of Existence, Sipé Gyalmo [Tibetan srid pa’i rgyal mo]. 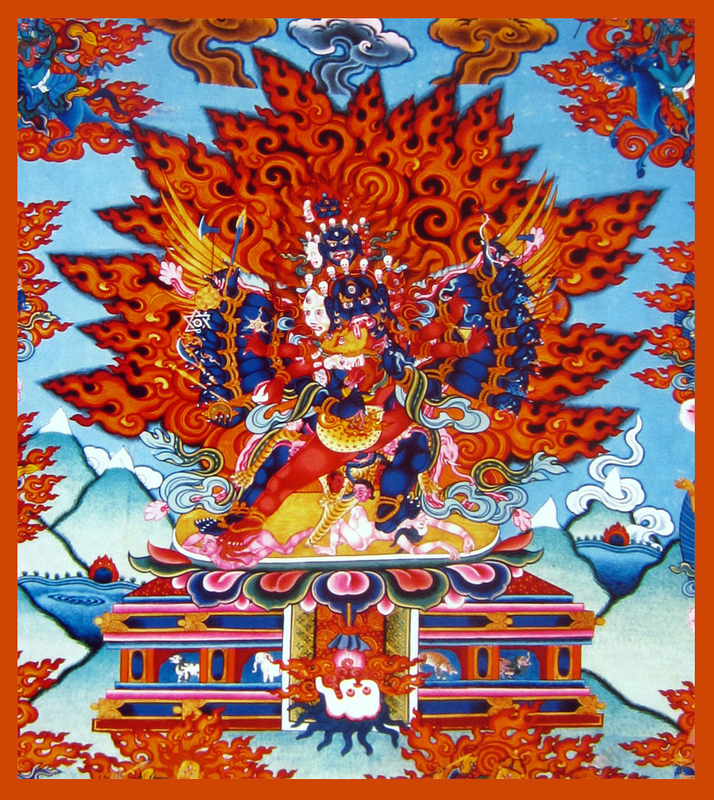 She is an enlightened being who is uniquely a protector and also a yidam, or meditational deity. 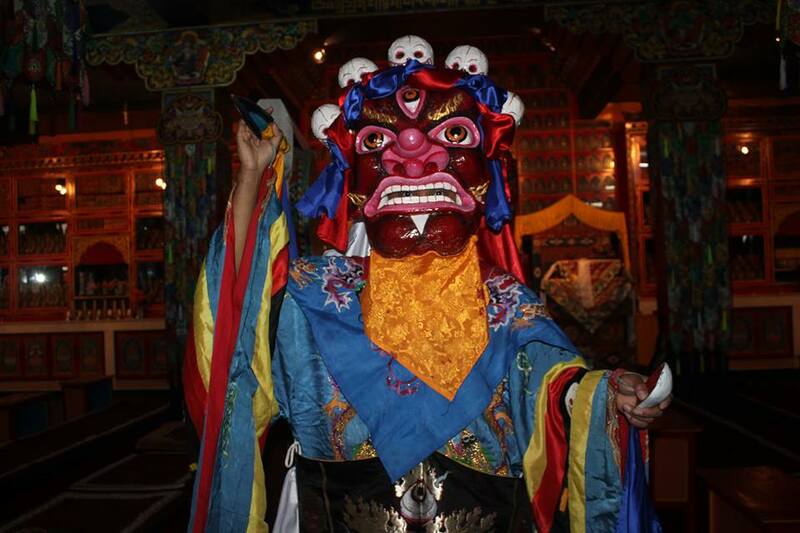 She is one of the principal female deities, and her invocations and offerings are performed daily in Yungdrung Bön Monasteries. She protects from enemies, danger, illness, misfortune, and confusion. 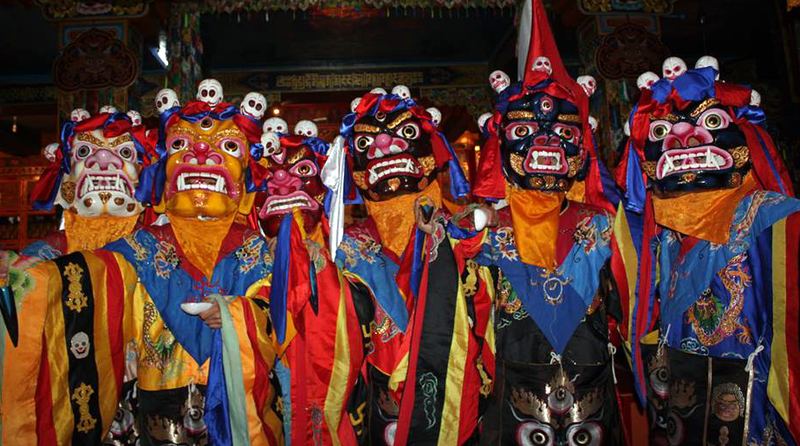 Monk dancers dressed as the the Six Manifestations of Sipe Gyalmo. Photo credit: Unknown. Sipé Gyalmo has countless manifestations and emanations. 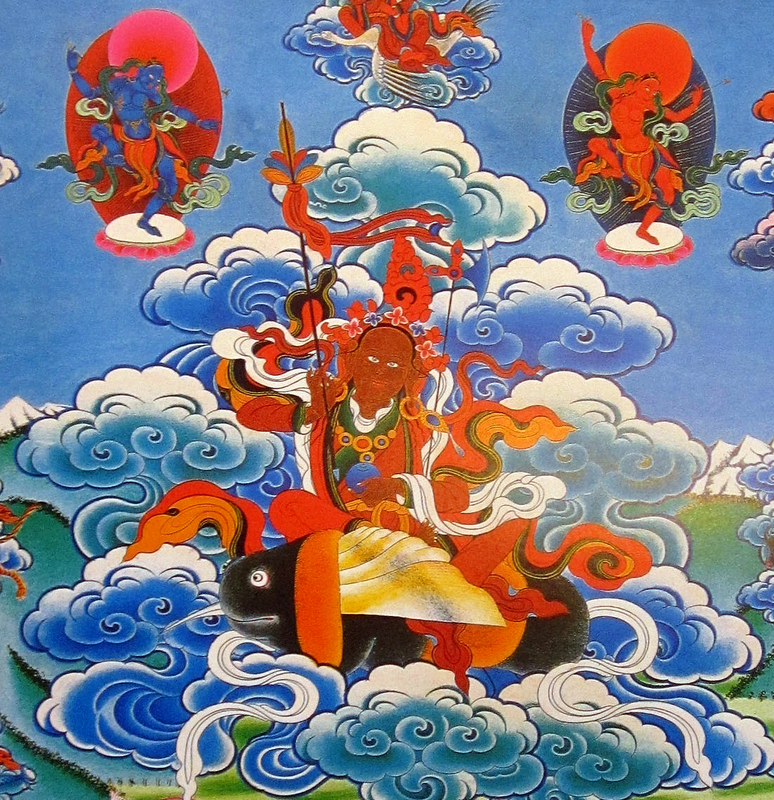 She manifests with different characteristics in order to meet the varied needs of sentient beings. She manifests riding a red mule, riding a black mule, and standing with a hundred heads and thousands of arms and legs. Her Body emanations are the Six Manifestation of Day and Night. Each of these six manifestations arise during a particular cycle of time during every twenty-four hour period. These six manifestations are White Sipé Gyalmo of Dawn, Golden Sipé Gyalmo of Sunrise, Red Sipé Gyalmo of Mid-day, Maroun Sipé Gyalmo of Sunset, Black Sipé Gyalmo of Evening, and Dark-blue Sipé Gyalmo of Midnight. According to the Yungdrung Bön religious calendar, there are specific days set aside for the practice of Sipé Gyalmo riding a red mule. These dates are according to the lunar calendar and vary according to the month. During the 1st month of each season, which is the 12th, 3rd, 6th, and 9th lunar months, her practice day is the 8th lunar day. During the middle month of each season, which is the 1st, 4th, 7th, and 10th lunar months, her practice day is the 4th lunar day. During the final month of each season, which is the 2nd, 5th, 8th, and 11th lunar months, her practice day is the 5th lunar day. 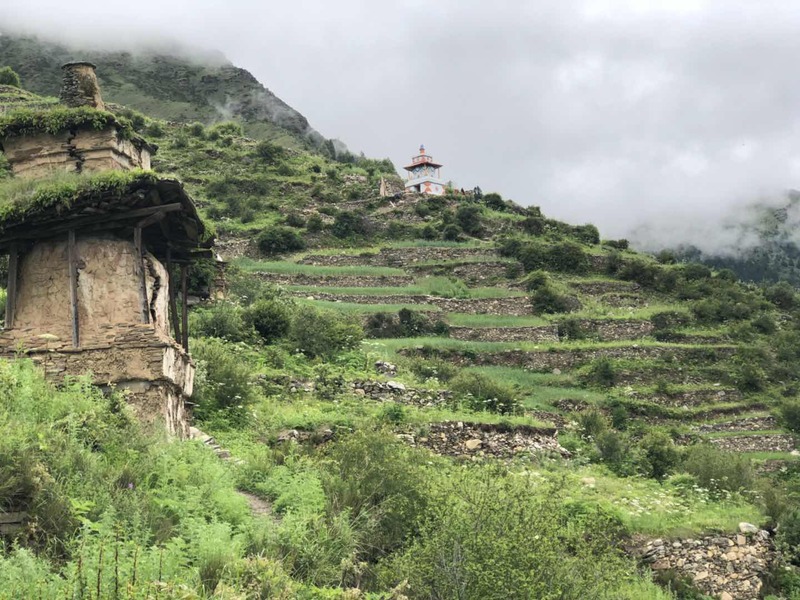 When traveling, one can specifically include the Goddess of Travel, Chammo Lamlha, in the morning smoke offering, and also offer her torma in the evening, while asking for her protection. 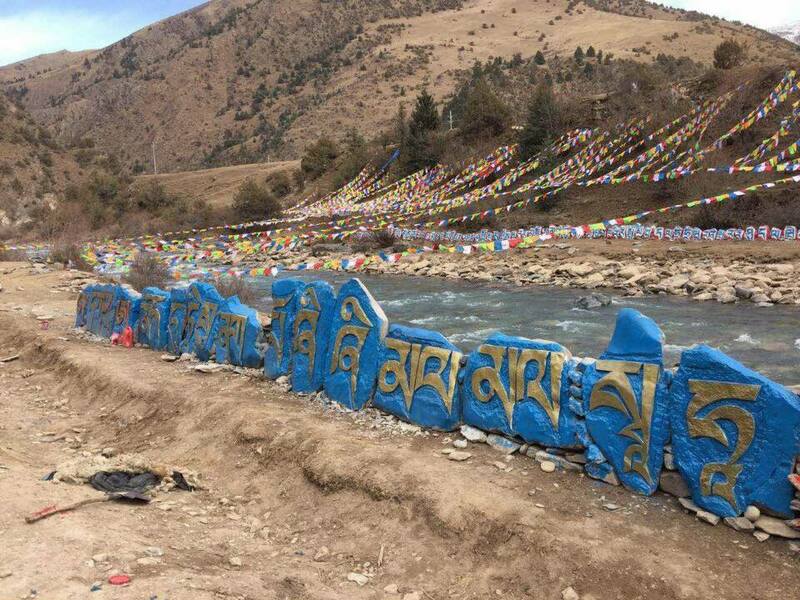 Although there are longer invocations of her and her retinue, this is a concise invocation that was written by His Holiness 23rd Menri Trizen Nyima Tenzin Rinpoche when he saw her in a vision at the age of thirteen. 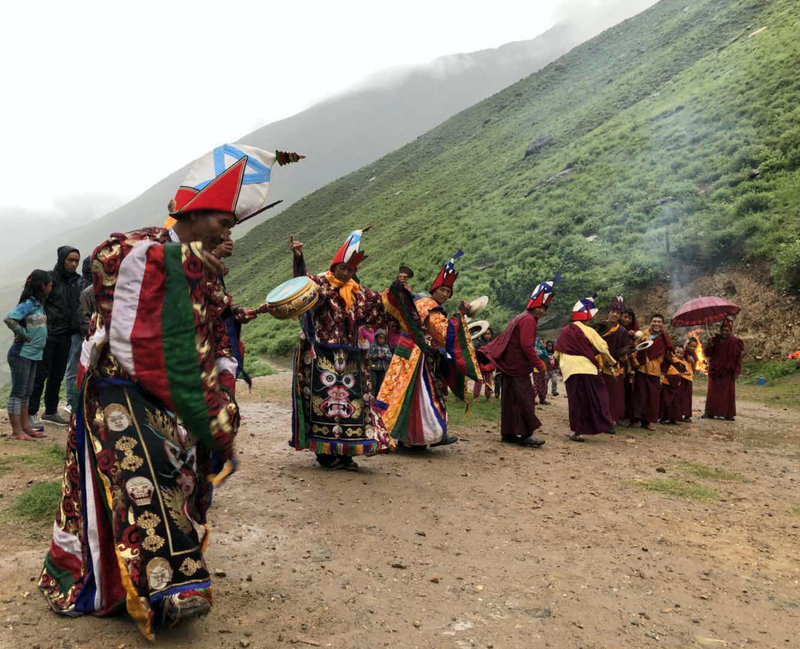 Chammo Lam Lha, together with her retinue. Come here now and keep your protection vow! Please accept these offerings of smoke and torma. Please act to accomplish this entrusted activity! Translation Raven Cypress Wood ©2015 All Rights Reserved. No publication permitted. 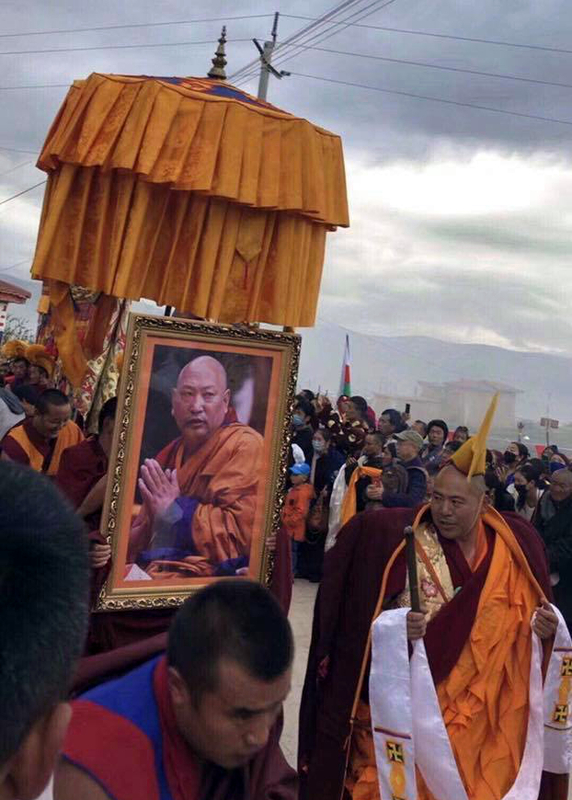 The Long Life yidam, Drenpa Namkha and Khandro Oden Barma. 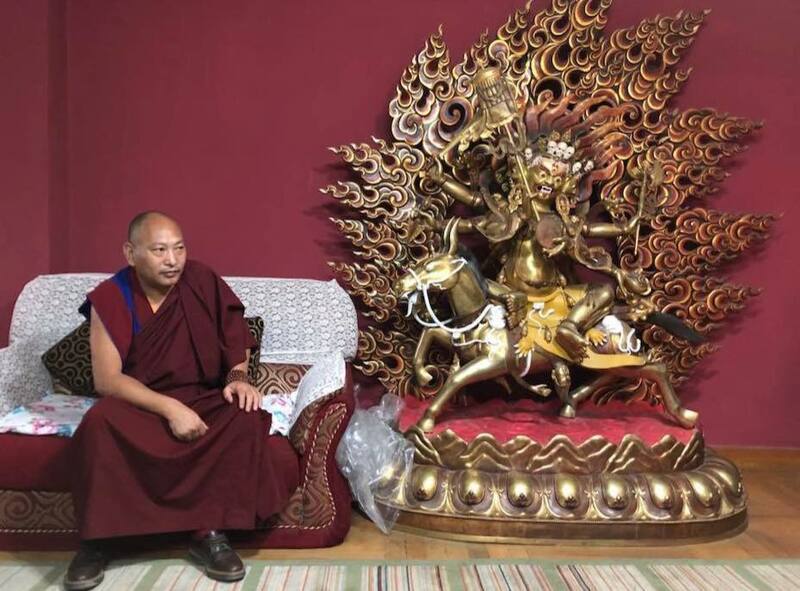 On November 9th in Washington Depot, Connecticut, His Eminence 7th Kündrol Namkha Trinley Wangyal Rinpoche will bestow the long-life empowerment of Drenpa Namkha. 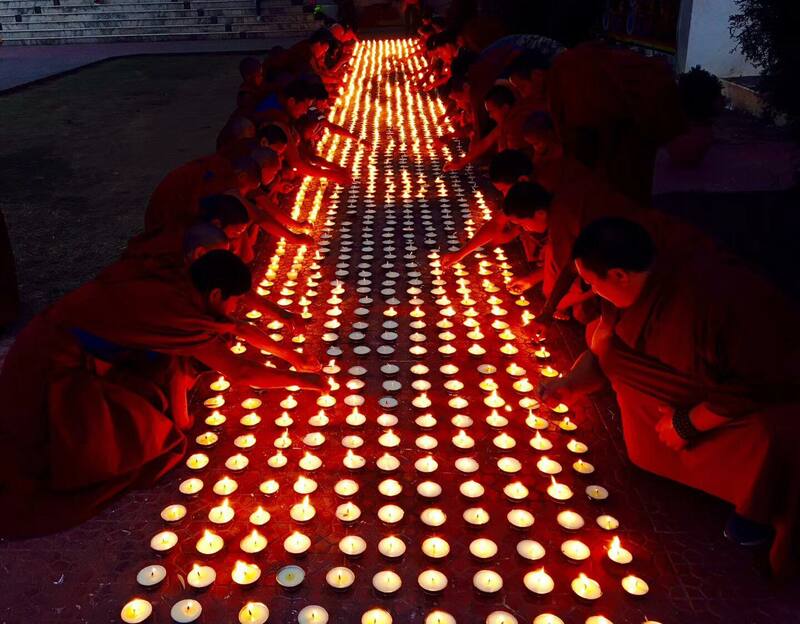 From November 6th – 8th, the public is invited to view the ritual creation of The Accomplishment of Longevity of Drenpa Namkha sand mandala by a small group of monks from Menri Monastery. 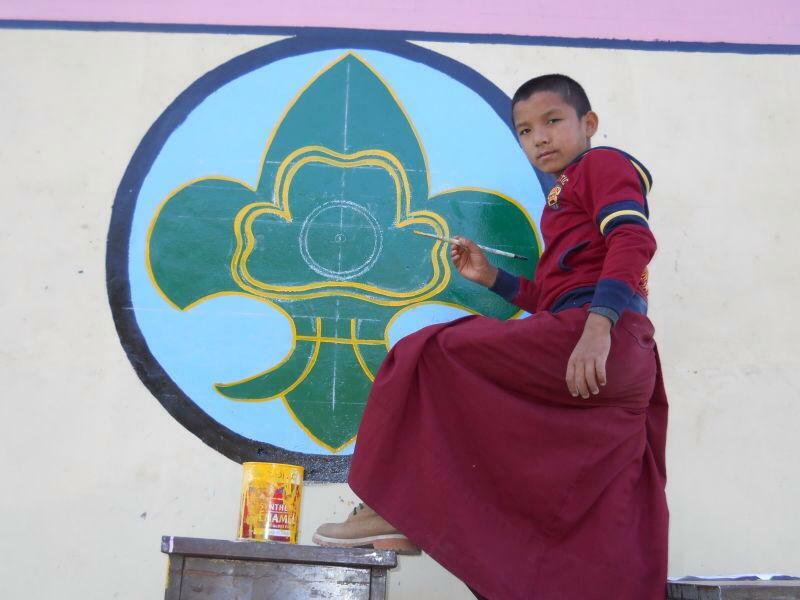 This mandala will be an external support for the sacred presence of Drenpa Namkha and Öden Barma during the empowerment. 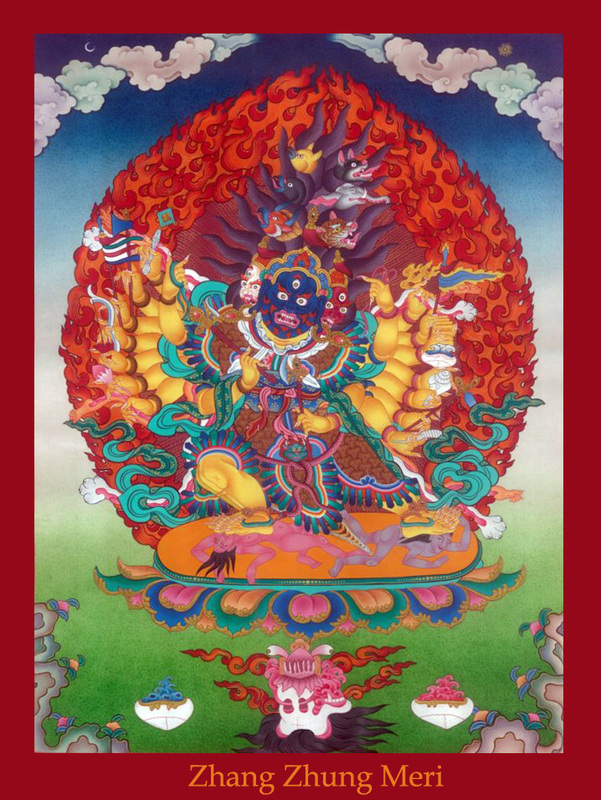 On November 10th, the empowerment ritual will conclude with the ceremonial dissolution of the sand mandala and the traditional sacred Dance of Victory of the religious protector, Sipé Gyalmo, the Queen of Existence. A long-life empowerment, when joined together with the faith of the participants, is a method to repair and restore the lifespan, vitality, health, and prosperity. Because the long-life ritual involves the restoration and balance of each of the five elements that constitute our body, energy, and mind, it therefore also restores and strengthens the soul. Receiving this kind of blessing also removes external obstacles such as danger and accidents, internal obstacles such as illness, and secret obstacles such as confusion and unhealthy thought patterns. 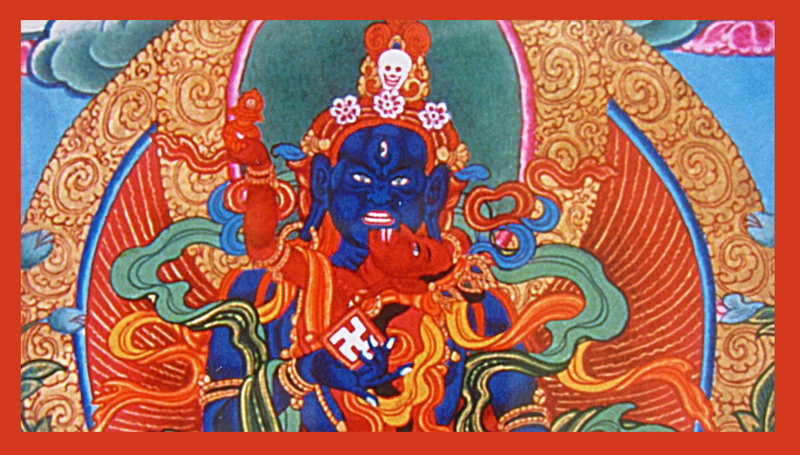 By receiving the empowerment, the mandala of the deity is ‘opened’ to the practitioner. 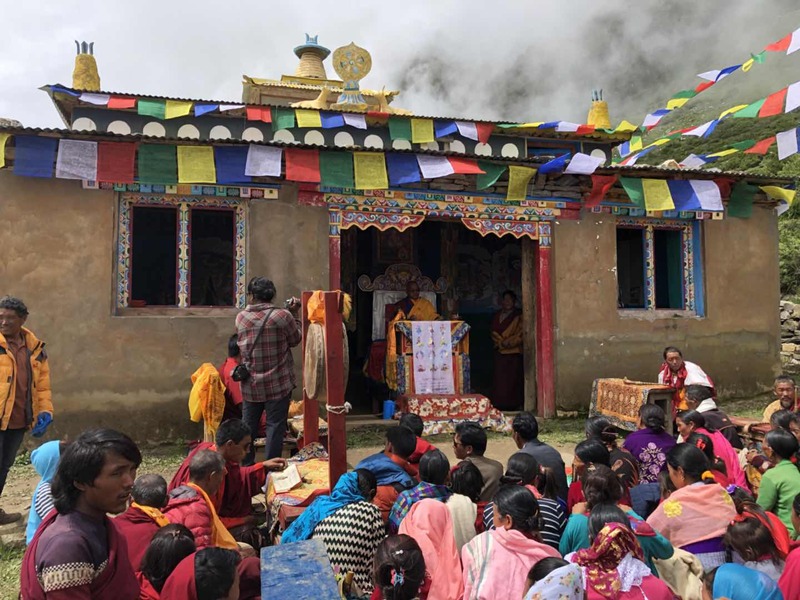 Because of that, they can now receive blessings and develop the enlightened qualities of the deity through formal practice of the deity, recitation of the specific mantra of the deity, or by making offerings and supplications to the deity. 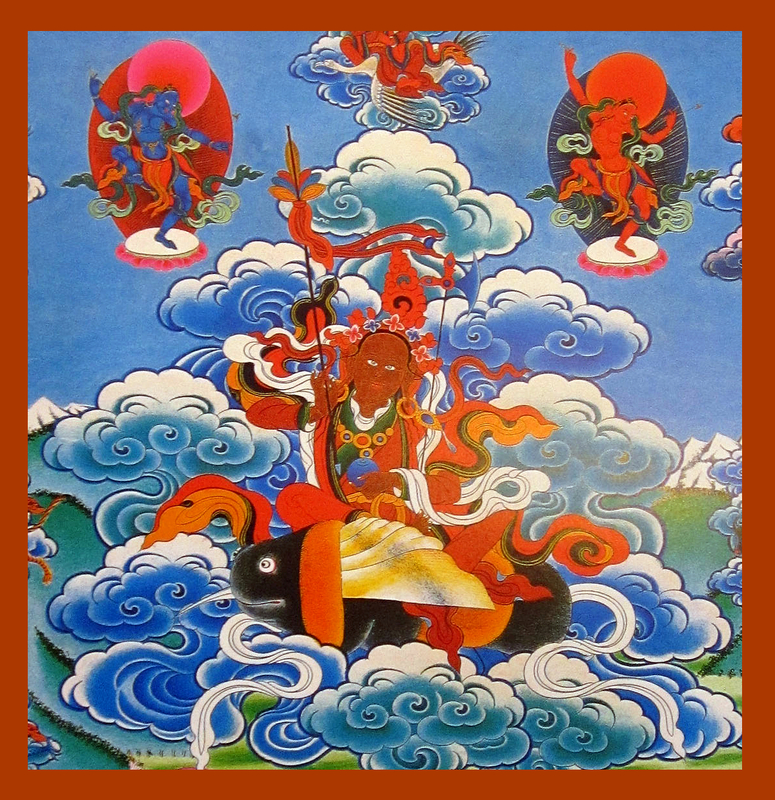 Drenpa Namkha was a realized Dzogchen practitioner who also exhibited great power and skill due to his mastery of tantra. In this ritual, he is practiced as a yidam for his quality of gaining mastery over his lifespan. 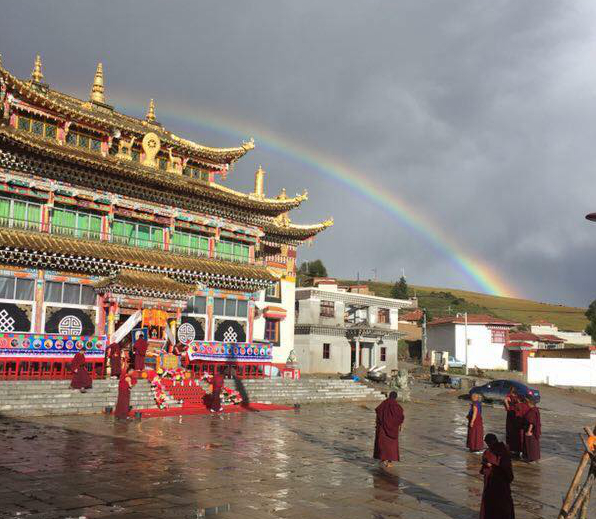 (See previous post: https://ravencypresswood.com/2016/05/06/practice-of-the-great-lama-drenpa-namkha/ )Within the Yungdrung Bön religious tradition, the 10th lunar day of each month is designated as a time to perform practice and make offerings to Drenpa Namkha and his two sons: Tséwang Rikdzin and Pema Tongdrol. According to Tibetan astrology, the ages of 1, 9, 13, 25, 37, 49, 61, 73 and 81 are considered obstacles years, and therefore, an ideal time to receive long-life empowerments. Creating a mandala for an empowerment is necessary in order to have a proper support for the deity and their retinue during the ritual. It is a kind of sacred architecture with dimensions and details described in the sacred texts. 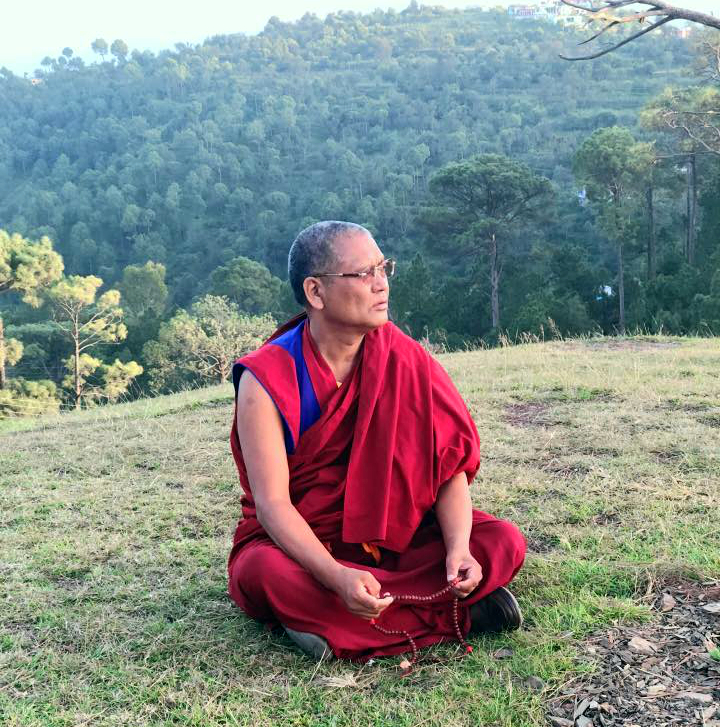 Although enlightened beings are beyond form, because of their compassion, they manifest in form with specific aspects so that we can more easily connect with them. According to the scriptures, all mandalas are to be made of sand. However, because this is not always possible, using painted images of mandalas became a substitute. 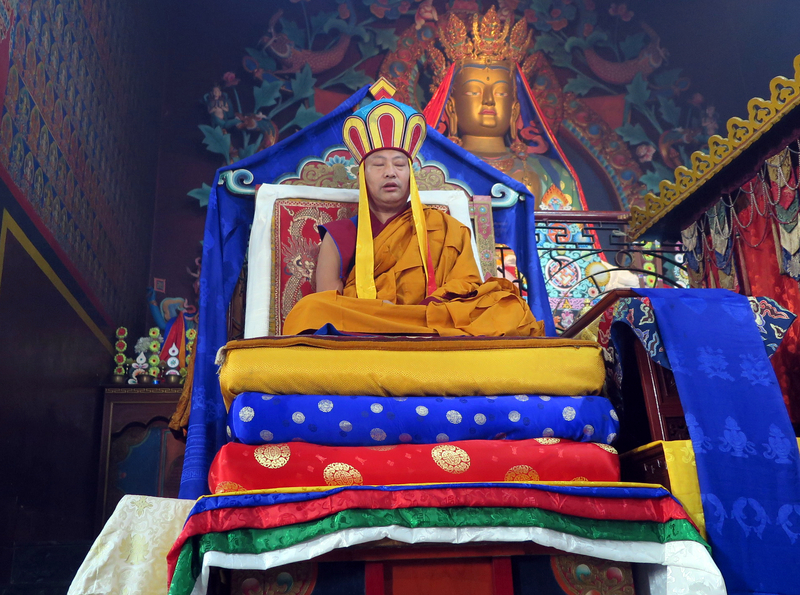 During the ritual, the lama visualizes the mandala arising from the five elements as an immeasurable palace. 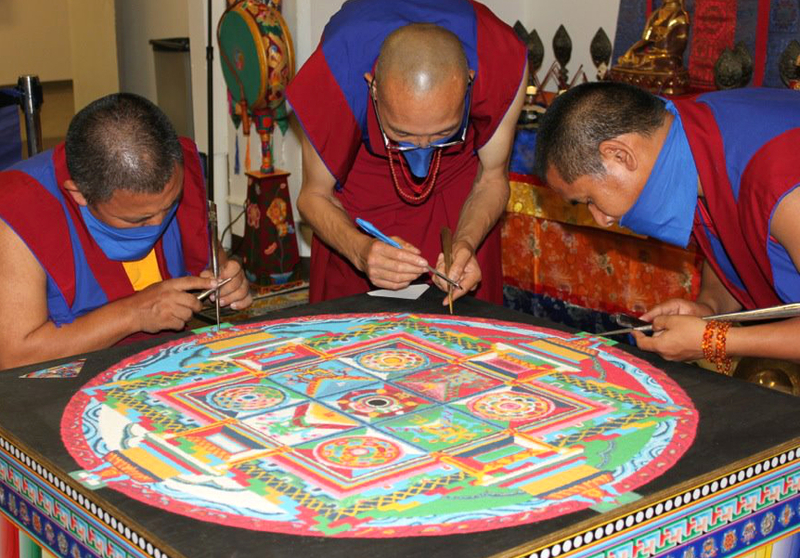 In this way, every mandala has three dimensions: 1) the actual mandala realm, 2) the visualized mandala realm, and 3) the symbolic mandala realm represented by sand or paint. 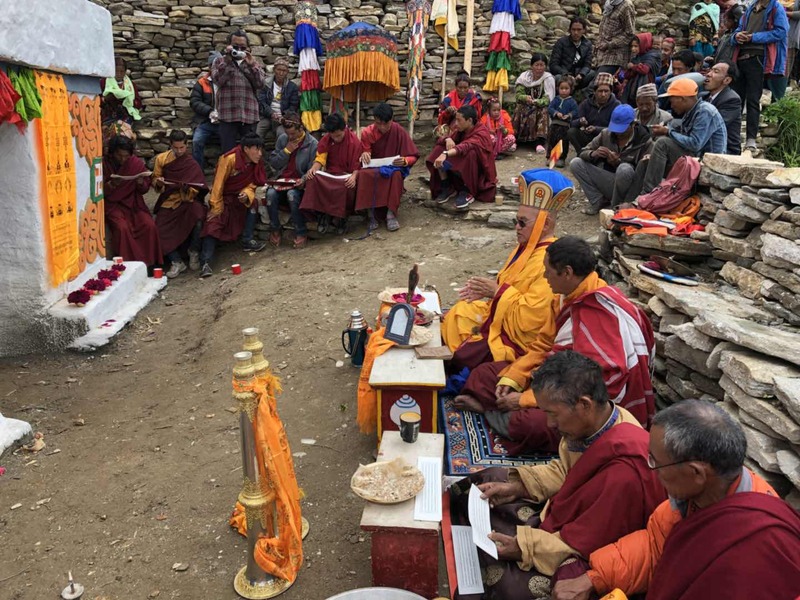 At the conclusion of the ritual, the mandala is dissolved and the sand is returned to the environment, often placed in a river, in order to bless it with the energy and power accumulated during the ritual. 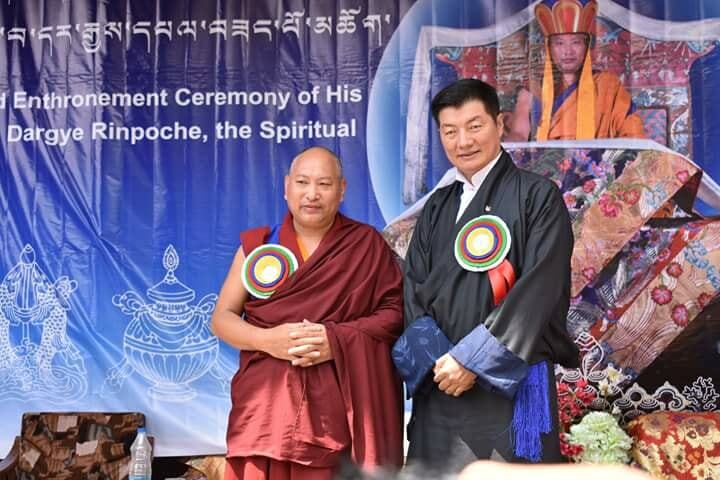 On the 24th day of the 7th lunar month in the Western year 2017, His Holiness 33rd Menri Trizen Lungtok Tenpé Nyima Rnpoche displayed his realization by passing into nirvana from his physical body. 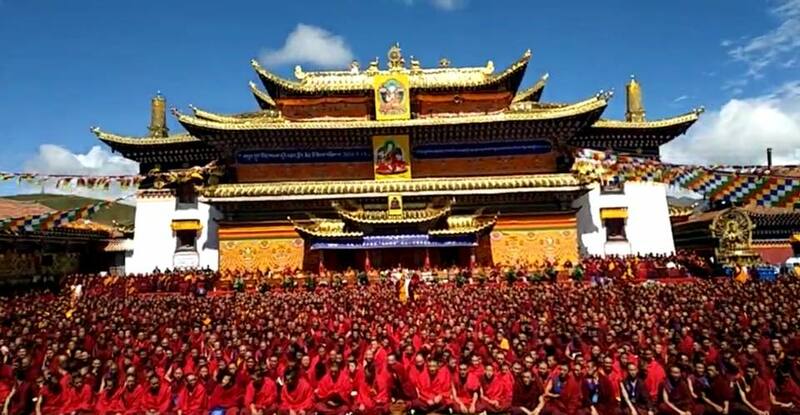 Tashi Menri Monastery, the seat of the leader of the Yungdrung Bön religious tradition, as well as multiple other monasteries and meditation centers, will commemorate this one year anniversary on the 23rd and 24th days of the 7th lunar month, Western dates September 3rd and 4th 2018. 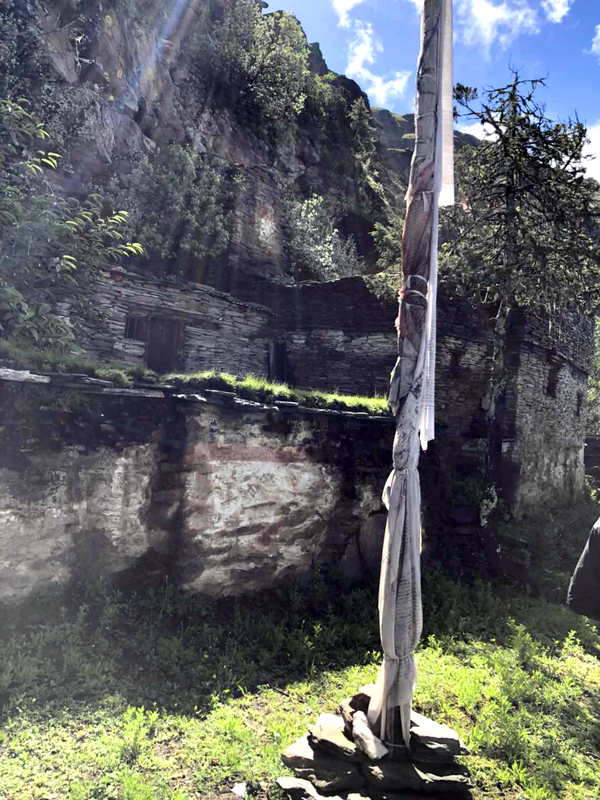 Golden statue of HH 33rd Menri Trizen Rinpoche in his home village. The omniscient wisdom of the Buddhas and Bodhisattvas of the ten directions is condensed into a single essence in you, Highest One. 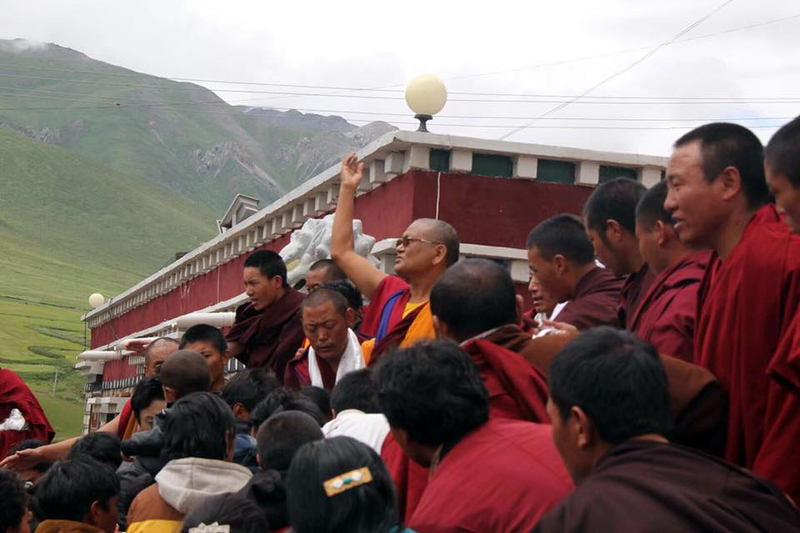 You carry out the enlightened activity of spreading the vast and profound teachings of Tönpa Shenrap. 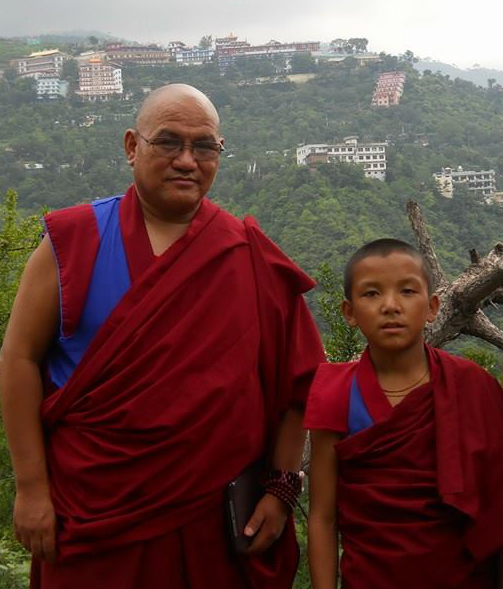 To you, Lungtok Tenpé Nyima, I pray. 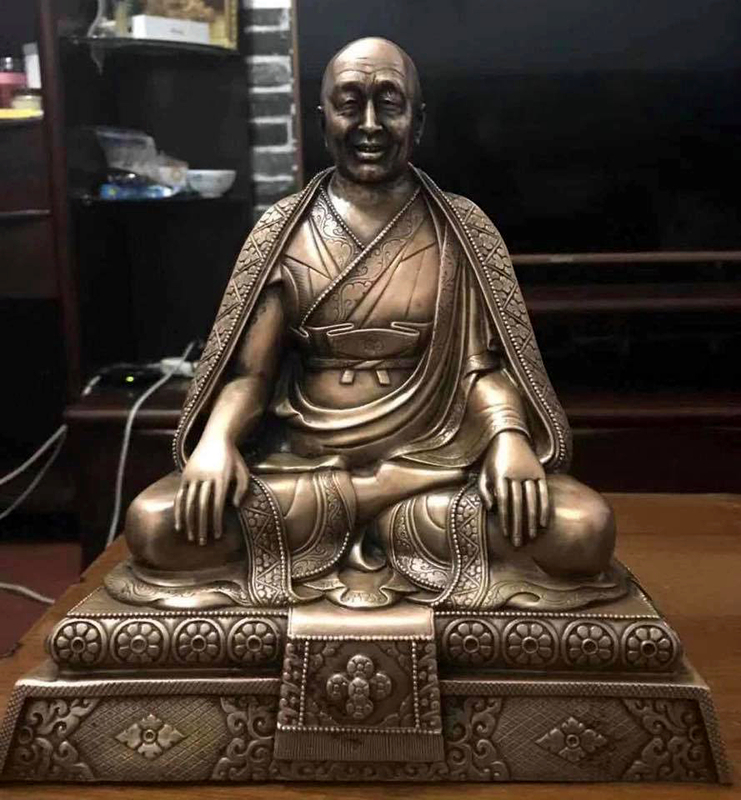 Silver statue of His Holiness 33rd Menri Trizen Rinpoche. Photo credit: Unknown. 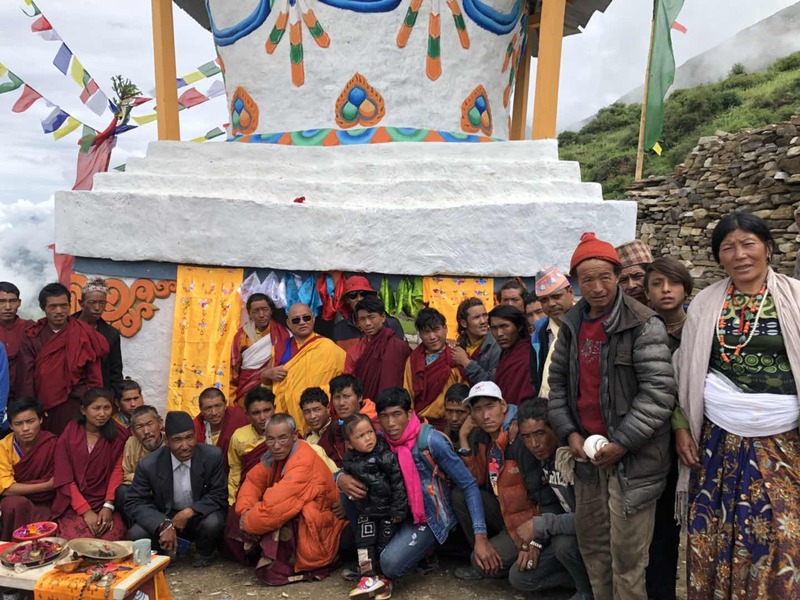 Murig Geshe Nyima Kunchap Rinpoche leads a Sherap Jamma ritual for the Yungdrung Bon community in the Dolpo capital of Dunai, Nepal. Photo credit: Unknown.